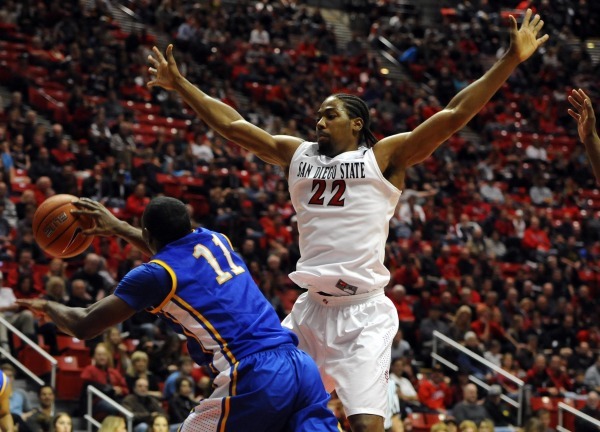 The Aztecs trailed 25-23 to the McNeese State Cowboys with 15 minutes left to play. Even after the halftime break, the ranked team was trying to give the game away to the 2-8 squad. The Cowboys were getting some good shots, especially early in the shot clock when the defense failed to retreat and get set. Who would have expected the visiting team to go on a 7-2 run after the break? In Viejas Arena? Against a team that has already beaten Creighton and Marquette? Something must have turned for the worse. Or that’s at least how I felt, sitting among groaning fans last night. I heard voices grumbling, imploring the Aztecs not to shoot jump shots. SDSU shot 0-10 from deep in the first half. But what should these guys do? Should Xavier Thames, the leading scorer, stop taking open shots? Should Matt Shrigley, the defined sniper of this team, stop looking for the shots his coaches have given him the green light to take at any time? Should Aqeel Quinn turn down a look after a kick out finds him standing all alone in the corner with 15:00 to go just because shots haven’t been falling to that point, so he should only shoot the ball if he’s under the basket? At one point, a man several rows in front of me just stood up and held his arms in the air (after a missed three by the Aztecs) at least 10 seconds into the next Cowboys possession. I couldn’t find it inside myself to disagree with him, or even tell him to sit down. It was a brutal first 25 minutes last night. Not even the Aztecs wanted to see themselves shoot that poorly. But here’s the thing: The Aztecs did get going and blew the Cowboys away. It took longer than we anticipated, but it might be better that the Aztecs did get tested. I think this was also a good test for the fans, too. Teams play bad stretches of basketball. The Aztecs had their first stinker half of the season. Nothing was going down. Until that 3 from the left corner by Aqeel Quinn. 26-25 Aztecs. 7-0 run by Winston Shepard. 33-25 Aztecs. X hits a three. Assist from? Yup. Winston Shepard. The Cowboys scrapped, scoring 8 points in about two minutes. Desharick Guidry’s lay up with 9 minutes left cut the lead to 7. Then Quinn let another one go from deep. Winston Shepard began to stride toward the rim. He leaped, collected the rebound, and threw it down with two hands, all in one smooth motion. Queue up a 15-0 run for the Aztecs with that tip slam – brought to you by Winston Shepard. The Aztecs wouldn’t look back from there. The Cowboys did not score for more than six minutes. And there it was. A 29 point win for the #24 Aztecs, just as the fans had hoped for. So does it really matter that SDSU happened to struggle to find the bottom of the net for 25 minutes against McNeese State? No. Even the best of the best will struggle from time to time. Look no further than to #2 Syracuse. 25 minutes into that game the Orange only led 45-40. Then they separated themselves, just like the Aztecs did on Saturday night. Arizona sure is having a great season. But the fact that they trailed 27-8 to Drexel at one point doesn’t change that because the Wildcats came to life and went on a tear to get that victory. We can’t always be box score doctors. Sometimes the end result is all we need to worry about. The shooting on the court may have made us forget the fact that we didn’t see any of J.J. O’Brien, Dwayne Polee, or D’Erryl Willaims on Saturday. Not to mention the fact that James Johnson rolled his ankle once again early in the first half. Winston Shepard didn’t even start. Two freshman – Dakarai Allen and Matt Shrigley – were in that starting lineup. Two key reserves were now starters. Someone else might be needed to spark a run off the bench. Those guys were no longer there to give the team a boost, but Aqeel Quinn stepped up once again. I was foolish enough to say he might be out of luck trying to find playing time in conference play because Shrigley, Allen, and Polee have already secured time for themselves, but then what does Quinn deserve for what he did last night? He finished with 12 points and 5 steals, a very nice contribution from a guy off the bench, but was even more active in another way. For the few possessions that slowed down, I noticed that Quinn was always talking on defense. He was pointing to his man and the ball – something all defenders should be doing at all times. I was 30+ rows up and could audibly hear him talking to his teammates on and away from the ball. Quinn and Josh Davis also scored 12 of the Aztecs’ 21 points in the first half. Where would we have been without those? Josh Davis keeps going about his business. Even when we asked if he could handle playing at a high level after the Arizona game. Even after we wanted to write him off because he struggled from the free throw line for a few games. Even after he’s now proved us all wrong, shown how important he is, and was in a perfect position to fold and beat his own chest. But Davis isn’t worried about proving anything to anyone. His days are numbered. He doesn’t have much time left to play this game at the college level. So what does he do? He fights like it’s the only thing he can do. He drags this team through a brutal first half by doing all he can, knowing the guys will pick up the slack in the second half. When nobody seemed prepared to answer the call Saturday night, Josh Davis and Aqeel Quinn stayed on the line ’till Shepard, Thames, Shrigley, were there at the other end. It looked like Matt Shrigley was on a short leash, especially for a guy who’s just about entrenched as the sixth man for a top 25 team. It’s easy to say he was in and out of the game because he wasn’t hitting shots, but he offers more than that. The redshirt frosh scored 8 of his 11 points in the second half, and only connected on 2 of his 9 three point attempts for the evening. But if you saw his layup in the second half, you know he’s much more than a guy standing in the corner hoping he gets open. He faked then dribbled toward the basket with his left and rose high above the rim. He could have tried to throw it down and destroy the poor help defender, but he simply adjusted and put in the finger roll. Shrigley also caught it on a break and rose with some bad intentions for his defender who opted to try to draw a charge. Unfortunately the defense got the call that time. The point is, we saw Davis, Shepard, and Shrigley all looking to play above the rim when they could. That can only mean good is on the way for a team that likes to run and attack the basket. So, the Aztecs pulled one out. They did so without one starter and one key reserve. Their best player, the X man, was not on his game but his teammates lifted him up. Winston Shepard came back focused from his one game suspension. His scoring was most noteworthy, but he was making an effort to see the floor as he looked to make plays, something he explicitly said during the postgame conference. He had just 2 assists, but only needed 5 field goal attempts to get 14 points. He could have taken 15-20 shots if he had tried to put the team on his back, but he stayed true to himself as a player, using his entire skill set. An efficient shooting night for Winston will correlate almost every time with great flow for this offense. Shepard and Thames make their teammates better by finding good shots for them. He wasn’t forcing shots, but took those shots and driving lanes when they appeared without a sliver of doubt in his mind to hold him back. That’s good for Winston; that’s good for his now 9-1 Aztecs.